Looking to the south of Saint-Aulaye beyond the River Dronne, the land is endless lines of long, forested ridges where hen harrier, honey buzzard and hobby are all found within the planted pines and clearfells. In late August, the Double Forest is quiet and no raptors are in the sky to help give their nest site away. The well managed forest grows on sands and gravels; the ‘poor’ soils having limited value for agriculture. This is 50,000 ha of largely empty wilderness with tourists mainly visiting the dark, peaty lakes. It was a wilder wilderness before the monks arrived in 1868 at the l’Abbaye d’Echourgnac to drain the wettest mires and marshes and so rid the land of malaria and improve the agriculture. The forest track winds through oak woodland with an understorey of hazel (Corylus avellana) and sweet chestnut (Castanea sativa) and sparse ground flora. Harebell, possibly Campanula patula, angular Solomon’s seal (Polygonatum odoratum) and a southern white admiral (Limenitis reducta) are all on the side of the stony track. Silver-washed fritillaries (Argynnis paphia) feed on a sunny patch of hemp agrimony (Eupatorium cannabinum). A bright pale clouded yellow (Colias hyale) droops to feed from the heads of marsh thistles (Cirsium palustre). 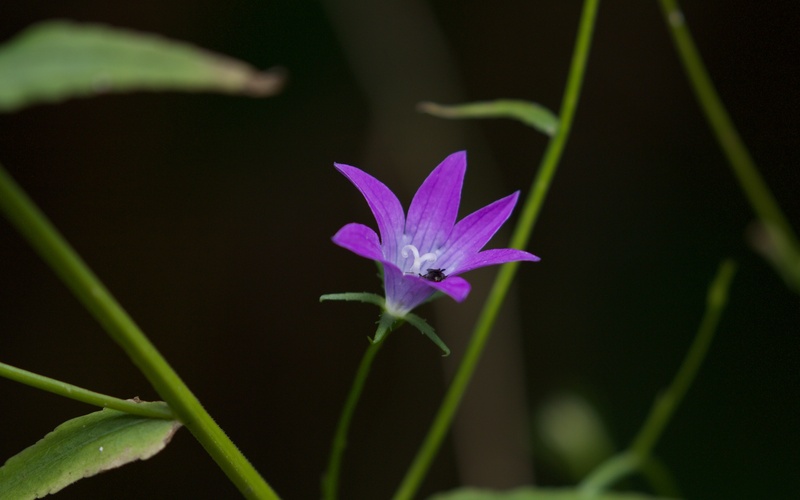 A harebell species, possibly Campanula patula, at the side of the forest track. 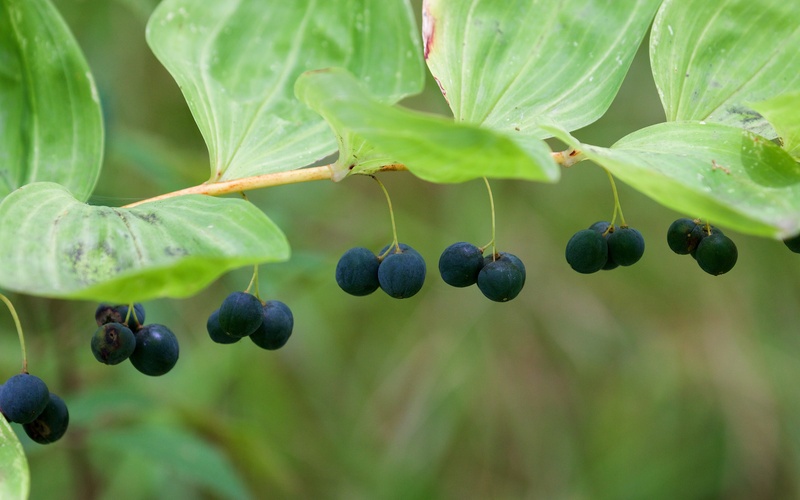 Angular Solomon’s seal with necklace of hanging berries. Further down the track and the planted pines, dwarf gorse (Ulex minor), heathers (Calluna vulgaris and Erica species) and bracken (Pteridium aquilinum) take over, with large clumps of purple moor grass (Molinia caerulea) in the wetter areas. 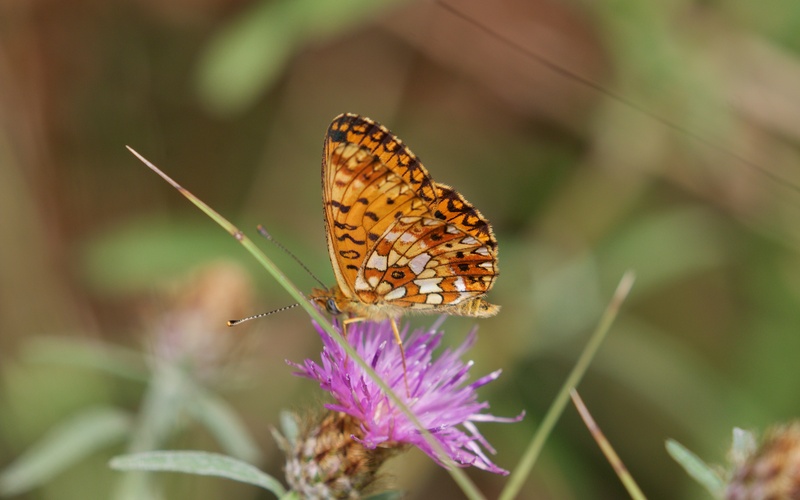 Three species of fritillary, work the hemp agrimony and skim the gravel road, including small pearl-bordered (Boloria selene), heath (Melitaea athalia) and the ubiquitous knapweed fritillary (Melitaea phoebe). A Provençal short-tailed blue (Cupido alcetas) vies for attention but a vivid long tailed blue (Lampides boeticus) steals the show. Small pearl-bordered fritillary on knapweed (Centaurea nigra). 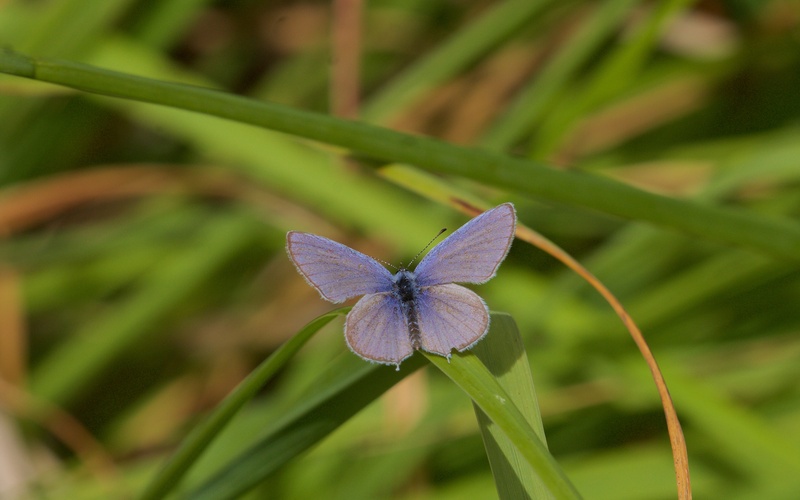 Provençal short-tailed blue showing off its tails. 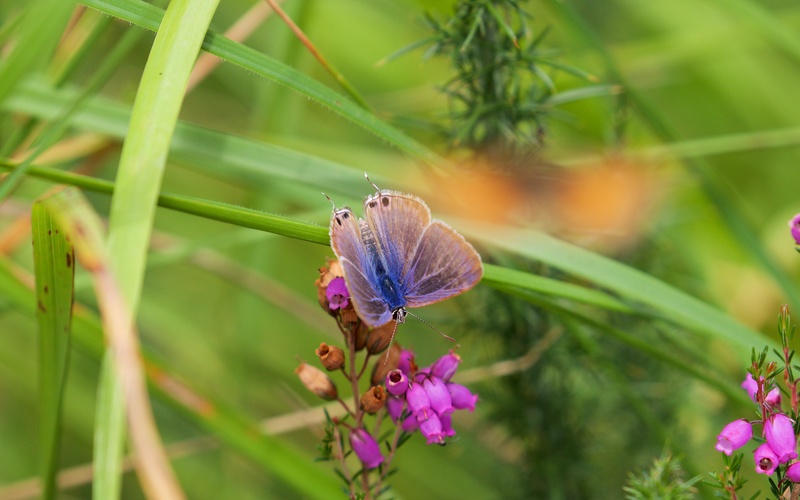 Long-Tailed blue amongst the bell heather (Erica cinerea) and grasses with blurred fritillary species behind. 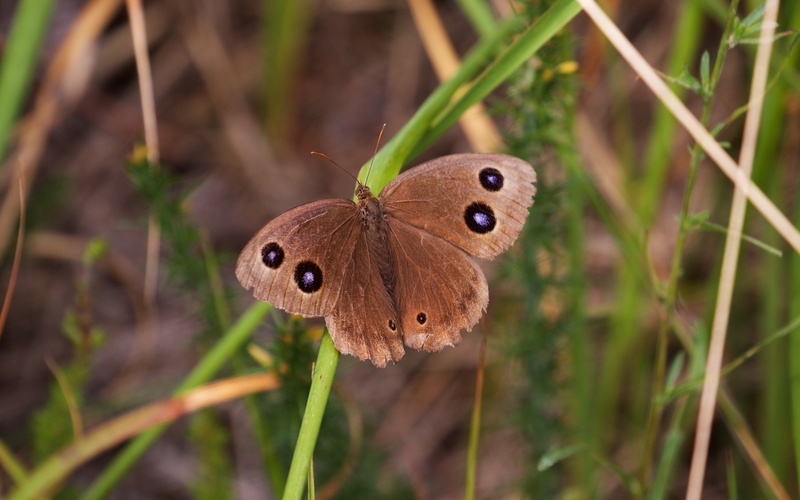 The most difficult butterfly to get close to is the large Dryad butterfly (Minois dryas) that flies low to then hide below bracken and grasses; it only flashes its wings wide open to show its metallic blue-pupilled eye spots on landing before remaining closed, still and immaculately camouflaged in its dark dullness. Dryad butterfly; a rare view of its beautiful, vivid blue-pupilled eye spots. Deptford pink (Dianthus armeria) grows by the wayside and brightens the dull green grasses. 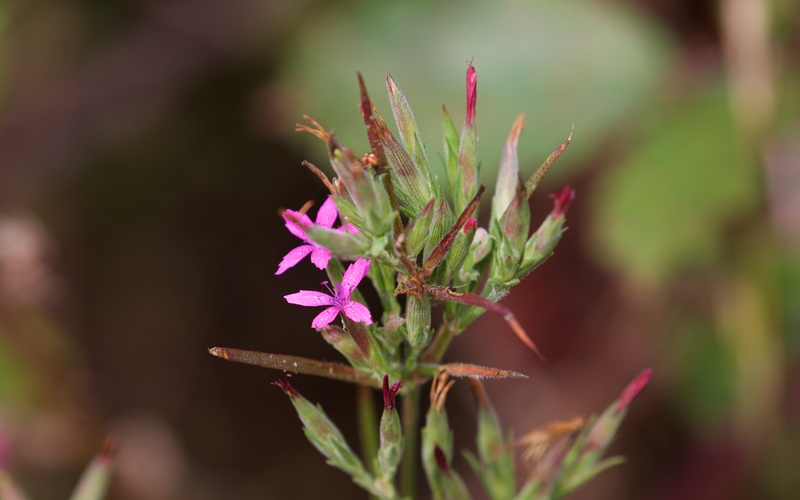 I walked miles to see this in England in July on one edge of Farningham Wood in West Kent as this account tells, but here, when least expected, it appears to be common on the well drained, heathland soils. Deptford pink a long way from East London. We visit the lake at La Jemaye which is a gaggle of tourists on the imported white sand and in the safe shallow water. This is a well advertised site for the false ringlet (Coenonympha oedippus) which occurs in the surrounding Molinia grasslands in June and early July. It is a long wait in the hot summer sun.